Founded in 1813, Warren County was named for Joseph Warren, a hero in the Revolutionary War and the man behind Paul Revere's famous midnight ride. 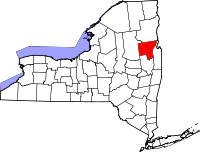 The county's population is relatively small at about 65,000, and over 25,000 of them reside in the county seat of Queensbury, NY. Among other agencies and departments, Warren County is served by the Warren County Historical Society which has thousands of genealogically and historically significant artifacts, documents, and records at its research library located at 195 Sunnyside Road in Queensbury. The library is open Tuesdays through Thursdays from 9:00AM until 5:00PM, and Society volunteers are on hand during those hours to assist researchers. They also accept long distance research requests which will be performed at the cost of $10 per hour. The Warren County Records Center in Lake George operates under the jurisdiction of the County Clerk and also has thousands of records and documents on file available for research.